This is a last minute invite to come down this evening and join us this evening as we raise money and have fun playing Bingo! Doors open at 6:00 pm and we start playing at 6:30 pm. Bring your friends and come out and have a great evening. If you are unable to join us at 6:30 stop down when you can! 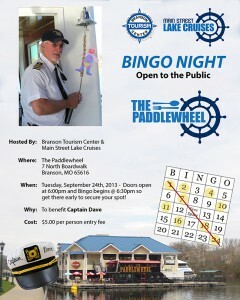 The Paddlewheel staff will be ready to serve you food and drinks including our yummy Copper Run Moonshine. Cost is one time donation of $5 per card, play same cards all night. Open to everyone. Located at the Branson Landing 7 North Boardwalk. Park in the Belk’s parking lot and catch our cruiser to The Paddlewheel. Home of the Haygoods for 2014! 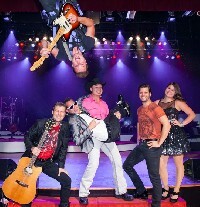 The Haygoods are one of Branson’s longest running shows, having performed over 6,000 shows for over 8 million people since 1993. They are known throughout the Midwest for their energetic, modern, and exciting style of entertainment. “We will be adding new production segments, new special effects, new music, new costumes, new lighting, and lots of surprises as usual for next year!” said Michael Haygood, Production Director for The Haygoods. Clay Cooper will continue as the headliner at his theatre with his show, Clay Cooper’s Country Express. Clay and his entire cast of 22 veteran entertainers will continue performing a high energy variety show four nights a week, Monday, Wednesday, Friday, and Sunday at 7:30pm and add morning shows at 10am, Tuesday and Thursday, during May and then September –December. 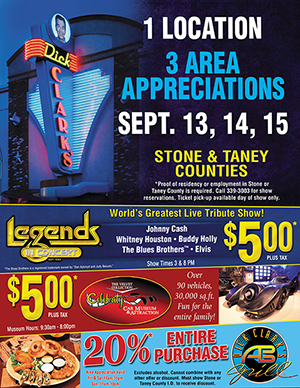 Clay Cooper Theatre will also be the home of Red, Hot…& Blue!, Buckets N Boards, and M-M-M-MEL TILLIS! Go to claycoopertheatre.com to receive more information! BRANSON, Mo., September 15 2013 – Ever thought about giving the gift of life to someone by donating your organs upon your demise? The First Presbyterian Church Ministry Team is hosting a free workshop that will not only explain what it means to be an organ or tissue donor and how to sign up to be on the National Donor List, but provide an opportunity for attendees to get any questions about organ or tissue donation answered. The workshop will be held on Sunday, September 22, in the Fellowship Hall of First Presbyterian Church at 420 W. Main Street in Branson. Professionals scheduled to be present at the workshop include Marjorie Bryan – Mid West Transplant Services; Matthew Aumiller – Taney County Ambulance; Jan Harper – Cardiac Pulmonary Rehab Cox Hospital; Henry Chaney – Greenlawn Funeral Home; Dr. Peter Marcellus MD; Michael Horn – Attorney; Pastor Tom Willcox – First Presbyterian Church and Mended Hearts Support Group. Local resident, John Long, himself a heart transplant receiver, and one of the organizers of the workshop said, “Without that donor heart I would have been the donor for other organs. I just celebrated ten years with that donor heart.” Long sees the workshop as an opportunity to make the community aware of the importance of being an organ donor. 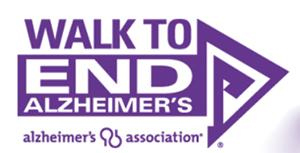 For further information on the workshop please call the First Presbyterian Church of Bransonat 417.334.3468.
of the Alzheimer’s Association. All ages welcome! Point Lookout—College of the Ozarks will host Mr. Bill O’Reilly, host of FOX News The O’Reilly Factor, to speak at a Patriotic Education Convocation on October 10, at 7 p.m., in the Howell W. Keeter Athletic Complex. Free tickets to attend this convocation are available on a first-come, first-serve basis at www.cofo.edu. A journalist for more than 30 years, Bill O’Reilly has now risen to the top of his profession. Monday through Friday on the Fox News Channel, The O’Reilly Factor causes the powerful in America to duck for cover as the rigidly enforced “No Spin Zone” deals with the nation’s most important issues in a straightforward and provocative manner. Blending news analysis with investigative reporting, The Factor has gained international prominence as well – it is now seen in more than 30 countries. With 12 straight New York Times Bestsellers including The O’Reilly Factor, The No Spin Zone, Who’s Looking Out for You, Culture Warrior, A Bold Fresh Piece of Humanity, and Pinheads and Patriots, and his most recent NYT bestseller, Killing Lincoln: The Shocking Assassination that Changed America Forever; as well as over 5 million copies of his books in print, Bill O’Reilly continues to be a highly sought-after author and speaker. Mr. O’Reilly also writes a syndicated newspaper column that is carried by hundreds of papers across the USA. Raised in a working class family in the huge housing subdivision of Levittown, New York, Mr. O’Reilly has stayed close to his roots. He still lives on Long Island and his best friends are neighborhood guys. But education sparked O’Reilly’s career. He graduated with a degree in history from Marist College, with a master’s degree in broadcast journalism from Boston University, and attained another master’s in public administration from Harvard’s Kennedy School of Government. Bill O’Reilly has won three Emmy Awards for Excellence in Reporting. He was awarded two National Headliner Awards while working as a national correspondent for ABC News and was honored by The National Academy of Arts and Sciences for his reporting and analysis on and after September 11th, 2001. The Patriotic Education Convocation featuring Mr. O’Reilly is sponsored by the College’s Keeter Center for Character Education, which provides convocations and programs that educate the head, heart, and hands of students, as well as the community.